Recent technological developments have greatly enhanced the quality and capabilities of PC desktop publishing. One of them is UltraScript PC Plus, a PostScript language-compatible interpreter that offers PostScript compatibility on non-PostScript printers. With this software marvel, I now have the power of PostScript at a fraction of the cost. Although it requires at least AT (80286) technology, UltraScript will run in as little as 640K of RAM. If you have at least 800K of extended memory, you can print without exiting your application. You'll need four megabytes of free disk space and DOS 3.1 or higher, but most AT-compatible computers can easily accommodate these requirements. Your laser printer will need at least a megabyte of memory to print a full page at 300 dpi. UltraScript supports an impressive list of printers, and even your dot-matrix printer can take advantage of PostScript capabilities. Change printers without resetting your computer simply by running the non-memory-resident version of UltraScript and selecting a different printer. There are two ways to print with UltraScript. The first requires that you print your file to disk, exit your application, and then print the file with UltraScript. If you have a megabyte of memory or less, this is the only way UltraScript will work. The second method is to load the memory-resident version of UltraScript and print from within your application. You select the PostScript driver for your application and print the file as usual except UltraScript redirects the output (with a program called PCAPTURE) to the PostScript interpreter; then it converts the file to a bitmap and sends it to the printer. The memory-resident version of UltraScript uses 44K of regular memory; the rest of the program resides in extended memory. If necessary, the print file is written to the hard disk. When I first tried to run UltraScript, I tried to print directly from within Ventura Publisher'using the memory-resident mode. The file eventually printed, but Ventura would not leave its print menu, and I had to reset the computer. I managed to solve this apparent memory problem only after spending the good part of a day trying to get through to technical support and then working through a solution. If I'd had customers waiting, it could have cost me money. 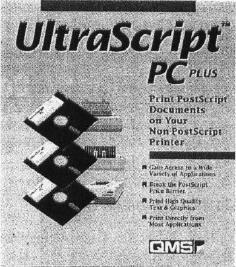 UltraScript offers you PostScript com­patibility on non-PostScript printers. After I finally got UltraScript up and running, it was a breeze to use. Printing with the program takes a little longer, but the wait is worth it. PostScript spoiled me with its simplification of font selection. I didn't have to exit Ventura constantly to make slight adjustments in font size. UltraScript comes with a good selection of fonts, and the Plus edition offers a total of 47 typefaces. There's also a version of this program called simply UltraScript PC, which offers 22 fewer typefaces (six families) but costs less and has the same system requirements. UltraScript will work with other PostScript fonts, such as those produced with Bitstream Fontware, but the manual warns you that using other vendors' fonts could result in longer print times. UltraScript PC Plus gives you the best of both worlds—the speed of an HP LaserJet or the power of PostScript—without doubling your costs.